How Can You Read the Jury’s Mind? As you prepare for trial, there are always dozens of strategic decisions you must make. When you look at a mountain of information, a list of potential witnesses, various argument strategies, how do you know what the jury will think is important? While pre-trial focus groups and mock trials are tools used on a wide basis by trial lawyers, everyone always has a kernel of doubt in their mind – are these 12 people really representative of the jury pool? While both research methods are invaluable in preparing for trial, no researcher would claim that the people in these groups are statistically a representative sample. Interviewing several hundred potential jurors in focus group or mock trial studies is financially unfeasible. But, now there is another answer. Our firm has developed You Be the Judge as a method for identifying the two or three most important arguments and elements of your case a jury needs to know. You Be the Judge quantitatively determines what a jury will or won’t care about. In addition, this pre-trial tool can identify the arguments appealing to different demographic groups within the jury pool. In civil cases, an approximate dollar amount a jury would award can be calculated and used when negotiating settlements. The Kitchens Group will build a model indicating the most important arguments for getting maximum awards from a jury. Here’s how the system works. Working with The Kitchens Group, the lawyers draft a brief paragraph describing the facts of the case. Thereafter, The Kitchens Group and the attorneys develop a list of the most important questions they need answered about the case. For example, is it important for the jury to know the plaintiff is a military veteran? Or, will the defendant’s country of origin be a significant factor in the jury’s deliberation? How much fault does a jury assign each person in the case? The Kitchens Group will gather surveys from people via the Internet, all of whom are demographically qualified to be on a jury, to Be the Judge. They will be told they are to be the judge in this trial, answer the questions on the survey, and be eligible to win a cash prize for participating in the survey. The Kitchens Group will apply a computer model to the data based upon the demographics of the population in the jurisdiction, thus producing a true representation of the jury pool and a report analyzing all the questions. This base price of this service can be executed for one-half to one-third the price of a mock trial. What Are the Major Benefits? Instead of a dozen or two dozen people in a focus group evaluating the case, a random sample of people in the jury pool evaluates the case. The demographic profile of the best jurors and worst jurors is statistically valid because they are based on large samples. The cost is less than focus groups. For a normal sample, it will equal the cost of a single focus groups. In our software, videos of potential witnesses can be presented and evaluated. The reaction will be of a true sample of potential jurors whose opinions will not be influenced by other participants like sometime happens in a traditional focus group. A online focus can be held with the survey participants following the survey. This new software operates like a chat room and the client gets a transcript of everything that is said. Dr. Jim Kitchens served as pollster and message consultant for Governor John Bel Edwards campaign. 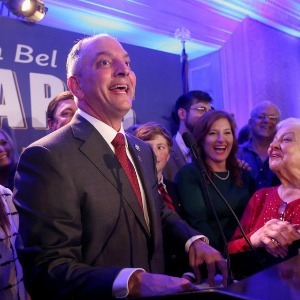 John Bel Edwards election was called the biggest upset in Louisiana political history by the Baton Rouge Advocate. It is the first time in modern Southern politics that a candidate elevated himself from the State House of Representatives to the Governorship. has been critically acclaimed as one of the original ideas and new works about American politics. 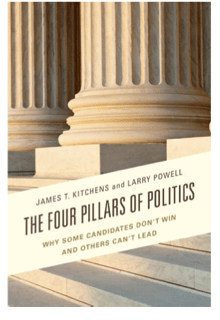 The book explores the major appeals that move American voters to support a candidate and the problems with leading a country that is ideologically separated.